Introducing the biggest Trailhead release ever. Trailhead now has a all new look, LinkedIn integration, localized trails and much more! Trailhead is a fun, easy and free way to learn Salesforce. But you already knew that. In fact, you’ve probably done some of the million+ challenges that have been completed and earned one (or more) of the 250,000+ badges that have been awarded in Trailhead to date. You’re probably wondering “what have you done for me lately”? Glad you asked! Today, we’re making Trailhead generally available (bye bye, beta) and releasing the biggest ever update to Trailhead with a fresh new look and tons of exciting new features. Let me highlight some of the exciting new features. If you go to Trailhead today, the first thing you’ll notice is the new user interface. We’ve taken all the feedback that you’ve given us over the past year (thank you for that btw) and designed a fresh new user experience that focuses on the core Trailhead values of making learning Salesforce fun, easy and guided. Here’s a quick look at the new experience. Trailhead has been busy taking language classes and now speaks French, German and Japanese! We’ve started by localizing 21 of our most popular modules and we’ll keep adding more over time. One of the most commonly requested features in Trailhead was the ability to share your well-earned badges on LinkedIn. It now takes a single click to do exactly that. Click the ‘Share on LinkedIn’ button after you earn a badge and it will automatically be added to your LinkedIn profile. We are excited to reinvent your Salesforce resume with Trailhead and to share your skills and accomplishments on the world’s most popular professional social network. Since we launched last year our content has grown by leaps and bounds. We’ve gone from 11 modules to 66 modules and projects (including the limited edition Catter and Dreamforce badges!) and have content for everyone – admins, developers, and business users for Sales Cloud, Service Cloud, App Cloud, Wave Analytics, and even Non-profits. To help you pick the trails, modules or projects that are perfect for you, we’ve added the ability to filter Trailhead content for role, level and product. It is now easier than ever to find and hike the perfect trail for you! We’ve also made it easier for you to get back on the trail if you take a break. Once you log in to Trailhead, the trails, modules and projects are automatically sorted in the order that you last worked on them. We’ve also added huge improvements to our global search. It’s now easier than ever to find exactly what you’re looking for in Trailhead. Simply type what you’re looking to learn into the top right search field and voilà (that’s Trailhead localization for you! ), you’ll see all the matching results, organized by the respective module or project. 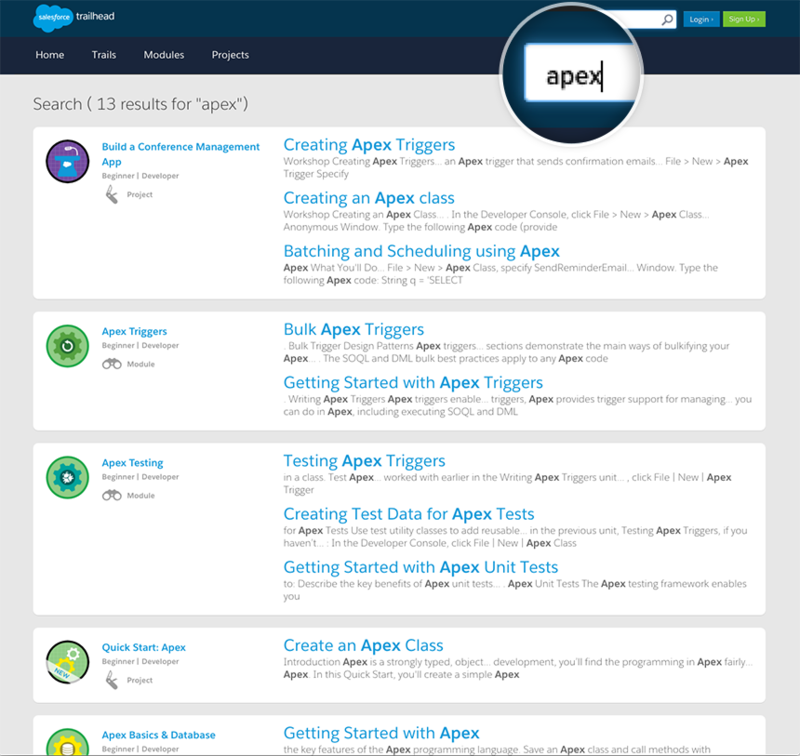 Projects provide step-by-step tutorials for getting hands-on with features like Lightning Process Builder, Apex, Lightning Components and much more. We’ve now integrated projects into your guided learning journey by listing ‘Related Projects’ for each trail. It’s been quite the journey for us as Trailhead has gone from 0 to 250,000+ badges. We’ve been humbled and energized with how you’ve embraced Trailhead and used it to transform your careers. We’re committed to making it better (and badgier!) every single day and this release is one step in that journey. Feel free to reach out to me directly if you have any feedback or suggestions on how we can make Trailhead better. We hope that you like the fresh new look of Trailhead and are excited to be on the journey to the next million badges together. Happy trails!